When you're giving a present, there are many reasons why you picked a type of wrapping. 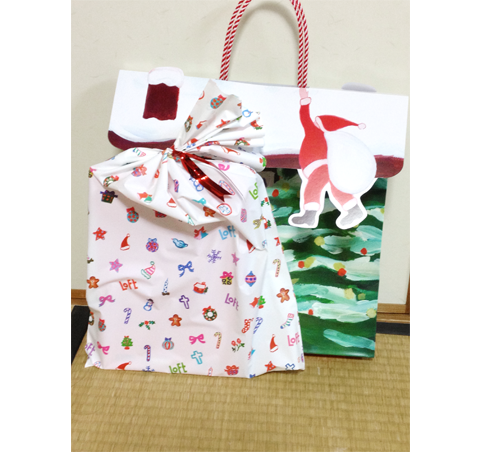 Functionality, Japanese or Western style differences, feeling of the season, consideration… But, I can't imagine giving an unwrapped present. The second Sunday in May is Mother's Day. I thought about giving my mother something she would like, but I couldn't think of anything…then, I finally remembered she likes "Sabazushi." The city of Kyoto I live in is far from the sea, but from long ago, on an important day, we eat often sabazushi. But, my father doesn't really like it so much, so my mother couldn't really eat it. So, I went and bought some from a sushi shop. 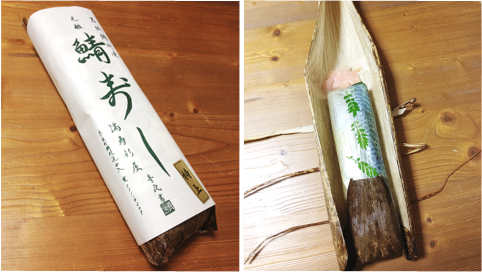 Since long ago, it was wrapped in a bamboo leaf then wrapped with white paper. Bamboo leaves are breathable and I hear they are also anti-bacterial. For cookies and cakes, a bright paper wrapping with a ribbon but it doesn't match sushi. Sometimes bamboo leaves are used in rice ball bentos too! Real bamboo leaves feel very high-class, don't they? I usually buy the cheap "bamboo leaf style" wrapping. When I travel far, the people I meet take care of me, so I buy a souvenir for them. there. This is something I bought at a store in Kyoto Station. It's wrapped in a Japanese style. I think it's because it's sweets from a town with a deep history. At large stations, they sell many kinds of fun souvenirs that are famous from that area or other areas, seasonal items, and sweets with the name of the area written on them. Flashy packaging is very common. Maybe because the amount of people buying them as trip souvenirs is a lot? I'm in my 50s, but I like western sweets more! I am a Japanese sweets fan. I feel recently that women are happier with Japanese style sweets. If you're in Kyoto, Japanese style, in Kobe, western style I think… I like both! I am not Christian, but I give my daughter a Christmas Present. I think I should give useful items, so I gave stationary. While wondering what's inside, my daughter looks serious but is excited when she's opening the wrapping. During the Christmas season, the wrapping is the most colorful of the whole year. Even in stores, they have special wrapping counters. At large stores, you take a number and wait for them to finish wrapping your present. Simple wrapping is almost always free. Even when I buy things for myself, I sometimes say "This is a present" and have them wrap it. I get it. Sometimes I want a ribbon of the brand I like, so I've done that before. Hahaha! I have never done that! Does your daughter open up the wrapping carefully? 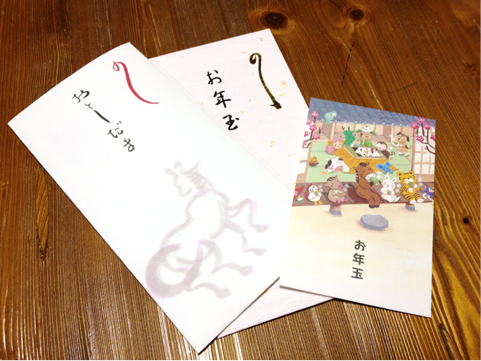 For New Years Day, I always give my nephew "Otoshidama", or "New Years Gift Money. 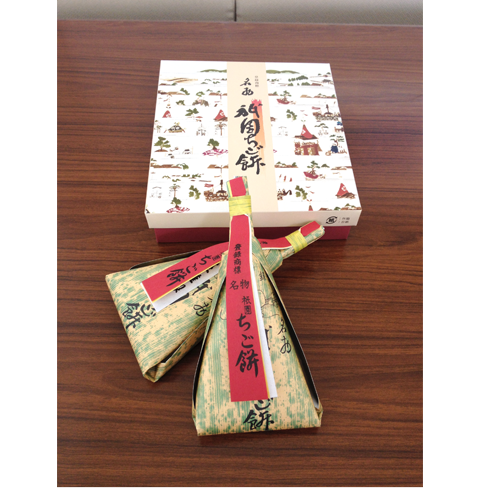 "Before New Years Day, many department stores, supermarkets, and convenience stores sell many different kinds of envelopes for the otoshidama. Because it's a celebratory season, bright colors are common. Thinking about the age, gender and other things, I try very hard to pick a great design. If the gift receiver can understand the thought behind the choice or not, this is the question. Why? Because while I can kind of remember the amount of money I received as a child, I can't remember the design of the envelopes at all. ↑ This is really true. Seriously!! I threw away the envelope right away. I remember adding any character envelopes to my collection. You don’t give them to your daughter?